Cotes du Ventoux is a subregion of southern Cotes du Rhone in France and it uses the same grapes in its blends as the rest of southern Rhone. This particular blend from Fondreche is 50% Grenache, 30% Syrah and 20% Mourvedre. On the nose there's violets, strawberry, black cherry, vanilla and the faint aromas of maple bacon and smoked breakfast sausage. It's medium bodied with soft tannin and vocal alcohol. The palate has plum, licorice, mocha, a strawberry spike and a gravelly minerality. It finishes with blueberry, oak, pepper and a touch of bitterness. 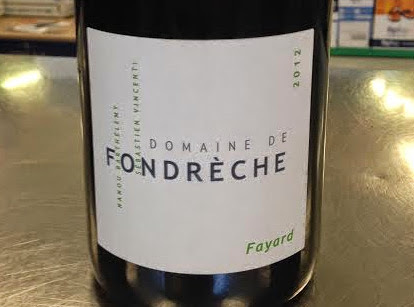 I feel that the Fondreche 2012 Fayard is not only another one of those perfectly balanced Rhone blends, but also an insane value for price-vs-quality. It's enjoyable in all aspects and in any situation. You could even give it a slight chill if you want. Pair with lamb, pork loin and herb-rubbed chicken.